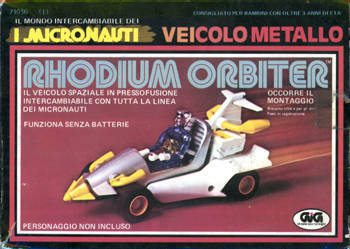 Whelp, it's the standard ol' Rhodium Orbiter, only this box is from the Italian version. Nothing new or different here. It's a shame that this vehicle doesn't include the see-through canopy as originally intended. It seems incomplete without it. Still, this is one of the cooler vehicles, tricked out seventies style with drag pipes in front and back and a great spinning projectile on the front. This vehicle also has some of the most durable wheels of any of the toys in the Micronauts line.